We’d love your help. Let us know what’s wrong with this preview of The Essential Wooden by John Wooden. Coach Wooden offers his hard-won wisdom on building an organization that performs at its full potential under pressure, from preparing and training the team to instilling personal drive and dedication. He takes his famous Pyramid of Success to the next level, filling the entire book with his straight-shooting personality and keen insight on human nature. Wooden shares rarely seen preseason letters to his players, revealing how he instilled productive attitudes and winning ways. He also includes previously unpublished analyses from former players and managers, including Bill Walton and Kareem Abdul-Jabbar. To ask other readers questions about The Essential Wooden, please sign up. Coach Wooden is extremely admirable; a man of integrity, respect... a legend. His pyramid of success is a great tool to live by and his teachings and beliefs are timeless. Harold - Excellent. Seemed like I highlighted the whole thing. A lot of times we read books by authors who we know little about. Unsure of how much of what they are writing have they personally experienced. This is very common among leadership books. This book should leave no doubt in the mind of the reader about the credentials of the writer - the legendary coach John Wooden. The book disseminates leadership jewels in small chunks of half a page to a few pages. This is a style you would see in a lot of other books as well. However, what really stands out a A lot of times we read books by authors who we know little about. Unsure of how much of what they are writing have they personally experienced. This is very common among leadership books. This book should leave no doubt in the mind of the reader about the credentials of the writer - the legendary coach John Wooden. The book disseminates leadership jewels in small chunks of half a page to a few pages. This is a style you would see in a lot of other books as well. However, what really stands out about this book is that the principles coach John Wooden describes here are the true tried and test formulas from the experiences of his life coaching UCLA basketball team and taking them to a pinnacle never reached before by any team in the history of college basketball. John Wooden with Steve Jamison provides an in-depth and interesting review of Coach's leadership lessons. A thorough review of the Pyramid of Success including the background of the placement of each word on the pyramid is great instruction of his leadership teaching. While, I have read Be Quick But Not Hurry in the past, I really enjoyed this book because of the voice of the players. Every 10-20 pages featured a letter from a player that gave new fresh perspective on Coach Wooden's teaching and John Wooden with Steve Jamison provides an in-depth and interesting review of Coach's leadership lessons. A thorough review of the Pyramid of Success including the background of the placement of each word on the pyramid is great instruction of his leadership teaching. While, I have read Be Quick But Not Hurry in the past, I really enjoyed this book because of the voice of the players. Every 10-20 pages featured a letter from a player that gave new fresh perspective on Coach Wooden's teaching and successful coaching style. In addition to the voices from the players, this book also included many of the letters that Coach Wooden wrote to his players at the beginning of each season. I loved this little book. John was way ahead of his time, focusing on principles like growth mindset over fixed mindset and success shouldn't be measured by the outcome but instead from being fully prepared and pouring one’s all into the effort. The lessons from this book apply to leaders in any setting, and it’s cool see them still applicable 40 years after his resignation. Great summary of some of the lessons can be found here. I read this book because I heard Kareem Abdul Jabber has a new book out about Coach Wooden and leadership. Wooden's book is very readable with small segments arranged in topical chapters. Some might call it old school, but the book contains tried and true principles. I gave my copy to my son, who could relate to it better than my daughter. Though Coach Wooden repeated "people under my supervisipn" so often that I think my daughter would relate to it too. Oh, and because unsed to watch UCLA play b I read this book because I heard Kareem Abdul Jabber has a new book out about Coach Wooden and leadership. As the title indicates this book condenses coach Wooden’s philosophies on leadership. What is truly surprising is the applicability of these principles to the corporate world just as much as that on the court. The fundamental basis of Wooden’s coaching philosophy is best described in the preface: “…success. as measured by each one of us individually, is the peace of mind derived from making the absolute and complete effort to do the best of which you are capable. 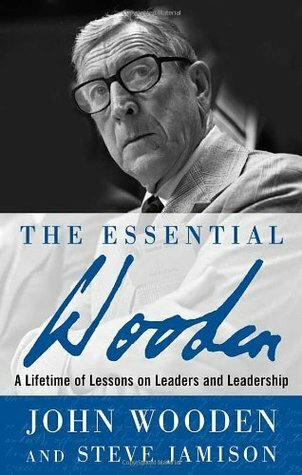 The quality of our effort to real As the title indicates this book condenses coach Wooden’s philosophies on leadership. What is truly surprising is the applicability of these principles to the corporate world just as much as that on the court. I personally have not watched Wooden coach a game, or follow his championship winning teams – but I can tell through reading this book that he was and through his work continues to be a great leader and inspiration. A highly recommended read, in which everyone can find numerous lessons to be learned and applied. 1- “Here is Dad’s simple guide for knowing what is right: “Do unto others as you would have them do unto you.”"
People who pick up this book might be interested in John Wooden, the person itself, or about improving yourself. This book is about the lessons of John Wooden and his messages he found out from the experience of leading a success basketball team. This includes authentic lessons and ways he coached the players. His lessons and messages are so real and authentic. So practical that no one would want to do it without any influence. But by reading this book, you would feel like you can do it, and tha People who pick up this book might be interested in John Wooden, the person itself, or about improving yourself. This book is about the lessons of John Wooden and his messages he found out from the experience of leading a success basketball team. This includes authentic lessons and ways he coached the players. If you are looking for ways to build on your leadership development, this is a good read. This book is about real life experiences that allows the reader to gain insight on how the legendary coach built championship teams by remaining true to himself. teachings, create better souls and make the world a better place. This book should be read by ever individual. Excellent book. Simplified philosophy on leadership and mentorship. A must read. отличная книга о замечательном человеке. рекомендую к прочтению! I picked this book up off a give away shelf. It turned out to be magnificent! Wooden was a very important figure in the history of American sports and had a lot to teach on the subject of leadership. I think it's time for a John Wooden renaissance. There's so much our current era can learn from a simple -- but incredibly insightful -- basketball coach from Indiana. Great guide to leadership. Sets the tone of how the little things impact your team and can create destruction or cohesiveness. My book I will be reviewing is called “The Essential Wooden”, by John Wooden and Steve Jamison. This book was published in 2006, only four years before coach’s death at age 99. This book falls in the category of Memoirs, Sports, and a Biography. John Wooden, (1910-2010), was the head coach for the UCLA Bruins basketball team from 1948 until 1975. John Wooden was born on October 14, 1910 in Hall, Indiana. As a college basketball player,Wooden became a scoring champion for Purdue University, and a My book I will be reviewing is called “The Essential Wooden”, by John Wooden and Steve Jamison. This book was published in 2006, only four years before coach’s death at age 99. This book falls in the category of Memoirs, Sports, and a Biography. John Wooden, (1910-2010), was the head coach for the UCLA Bruins basketball team from 1948 until 1975. John Wooden was born on October 14, 1910 in Hall, Indiana. As a college basketball player,Wooden became a scoring champion for Purdue University, and an All-American. Steve Jamison, the other author in this book has co-wrote many of John Wooden’s books. I don’t think I could really compare this book with other books I’ve read. I couldn’t really compare this book to another one I’ve read because I don’t think another coach for a different team would go so in-depth about how he leads his team toward victory and success on and off the basketball court. John Wooden and the UCLA Bruins won 10 NCAA National Championships in 12 years. You may ask yourself, how did he do it? The answers you're looking for is great leadership, hard work, dedication, effort, and control. As you start reading the book one thing you start noticing that John Wooden emphasizes leadership, which I believe is the main idea of the book. As you read this book you will learn many lessons from him. Like any coach he had a lot of criticism. To make his criticism count he got all the facts, he didn’t lash out, and he didn’t make it personal. In the book his former players made comments on his coaching style. “The intensity of the practice was the same intensity as a game. We did everything at top speed without taking any break to rest”, said Kareem Abdul-Jabbar. This book affected me in many different ways. I realize that my older brother will be graduating in a few months so I have to more responsible for myself. The book gives a good lesson on responsibility. At first I thought this bore me to death, but that was not the case. Wooden’s Pyramid of success, is a pyramid of things you must have in order to have success. They include faith, skill, loyalty, confidence, and team spirit. Since the book is more of a memoir and biography, this book is not suspenseful. There’s really no characters but, in the book I really liked Coach Wooden’s personality. This is a fantastic book...definitely on my list of book I need/should/will re-read. It's not hard to want to 'worship' at the alter of John Wooden. Like Peter Drucker, what he said and the way that he says it is not only awe-inspiring but life changing as well. John Wooden presents a clear and transparent view of his philosophy, character, discipline and courage that not only transformed college basketball but also the lives of many young men he coached. And he does so in a way that makes one wan This is a fantastic book...definitely on my list of book I need/should/will re-read. John Wooden presents a clear and transparent view of his philosophy, character, discipline and courage that not only transformed college basketball but also the lives of many young men he coached. And he does so in a way that makes one want to infect their own life with his teaching & philosophy. John Wooden was a great coach, arguably the best college coach ever. But he is a great man for his willingness to clearly share of himself with this book. Great read as I learned more about John Wooden. His former players called him - honest, a gentlemen, gracious, loyal, fierce, demanding. This books shows the philosophy and methods of a master teacher, consummate couch, & legendary leader who was able 2 teach his teams to win, not by drilling in them to go out and win but by teaching them to believe in a standard even higher than victory....doing their very best, consistently, giving 100 percent & not measuring themselves by anyone, only Great read as I learned more about John Wooden. His former players called him - honest, a gentlemen, gracious, loyal, fierce, demanding. As a coach, this book had many insightful ideas, ways of thinking and coaching stories. Essential Wooden lets the reader get into the mind of Wooden, a role model coach. The book talks in detail about his famous Pyramid of Success. I really liked the book, it got a bit repetitive towards the end. I pulled some good nuggets from this book. Spoiler alert! The biggest nugget was that if you practice to get better the wins just automatically come. And, when you do fail, you can still feel good that you did your best and can come back and make it right. Although failure for me is when you quit trying. A very pragmatice and basic values approach to demonstrating leadership and what is required of a good leader. Age ol principles which very much have a place in today's world. It is along the lines of Dale Carnegie. A must read for Bruins and NonBruins alike to learn from a one of a kind leader of ultimate character and integrity! More leadership development and insight into constructing personal courage and winning principles. Not just for the hardwood, but possibly the boardroom as well. If you are a leader or want to be leader, you need to read this book. The best of Coach John Wooden's thoughts on leading and leadership.